WHO/Europe has signed an agreement with the Ministry of Health of Greece to implement the health reform support programme for 2013–2015 in the framework of the Ministry’s health in action initiative. The project’s goal is to ensure better health and well-being for the people of Greece through comprehensive health-system reform. WHO and the Greek Ministry of Health inaugurated the new WHO Country Office in Greece. 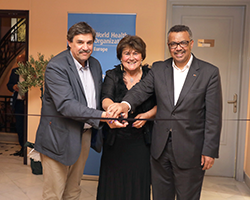 WHO Director-General, Dr Tedros Adhanom Ghebreyesus, and the WHO Regional Director for Europe, Dr Zsuzsanna Jakab were present for the official ceremony. The opening of the office reflects recent decisions taken by WHO and Greek leaders to strengthen bilateral cooperation, taking stock from past achievements.